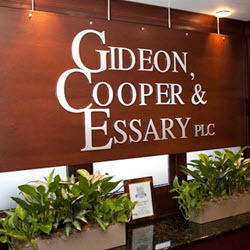 Gideon, Cooper & Essary, PLC is a boutique law firm that concentrates almost exclusively on health care litigation. This encompasses many different areas of law, as described in the firm's various practice areas. The firm's attorneys represent health care companies, hospitals, medical practices, and individual physicians and other health care providers in all jurisdictions (state and federal) in Tennessee and courtrooms across the country. Additionally, the firm's attorneys represent health care providers in disputes with federal and state agencies, matters with licensing boards, contract disputes, peer review proceedings, and various regulatory matters. Gideon, Cooper & Essary PLC is listed in U.S. News - Best Lawyers for the "Best Law Firms for Medical Malpractice Law Defense and Personal Injury Litigation Defense. Attorneys at Gideon, Cooper & Essary PLC are frequently listed as Best Lawyers in America, Superlawyers, and Tennessee's Top 150 Lawyers, and in various other publications.